With a suitcase and a dream, Walt Disney set out west with the hopes of a bigger success in showbiz after his initial animation foray turned sour thanks to some shady business dealings. Fortunately, he had a little friend named Mickey Mouse that would soon turn Walt into one of America's great success stories. But it's important to remember that Walt came from relatively modest beginnings--a mindset he kept throughout his life, even as he became wealthy and successful. He was always a man of the people, desiring to serve the people. He regularly strolled through Disneyland Park to observe operations from the guests' point of view, and he chatted with visitors as well to learn the good and the bad--all in an effort to improve the park. This every-man's spirit is reflected in the Storyteller's Statue, which is just as accessible. That's why so many fans lovingly call him Uncle Walt. He just felt like a family figure! 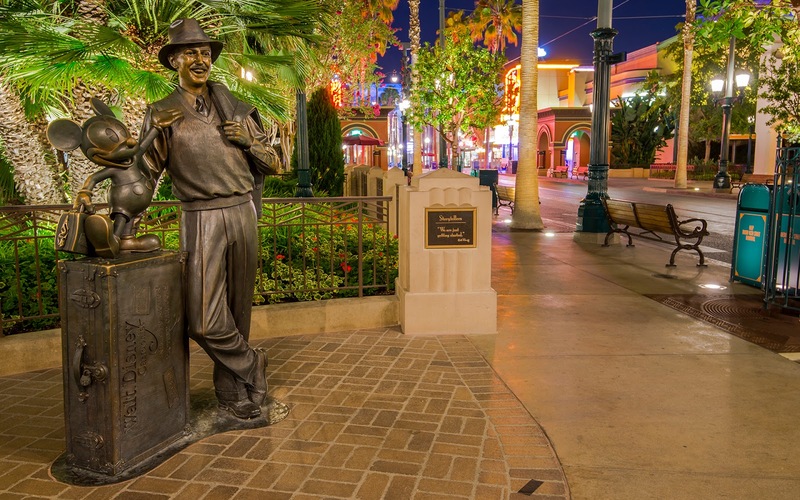 The very approachable Storytellers Statue at DCA stands cheerful in the peaceful night.